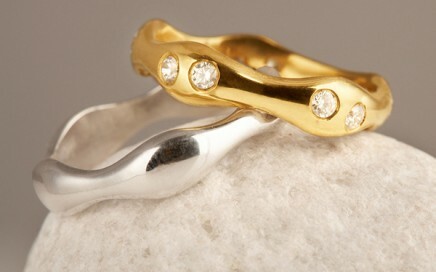 Wedding rings can be made in White, Yellow, Rose or Green 9ct, 14ct 18ct Fairtrade gold, or Platinium. 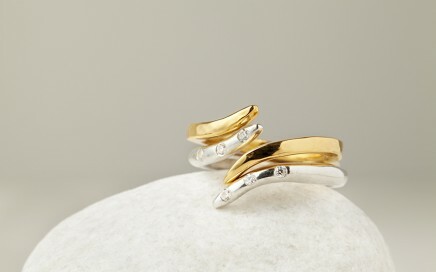 The plain band sizes start from 2mm upwards and can be made in flat, D shaped or court design. 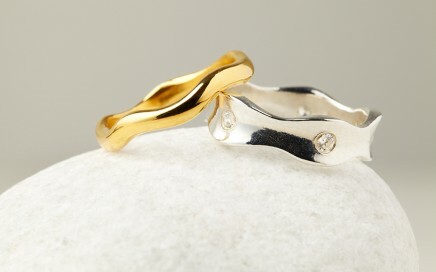 An elegant wave of Twelve 2mm (0.18 carat) Canadian Diamonds ripples around this 4/5mm wide 18 carat Fairtrade Gold ring. 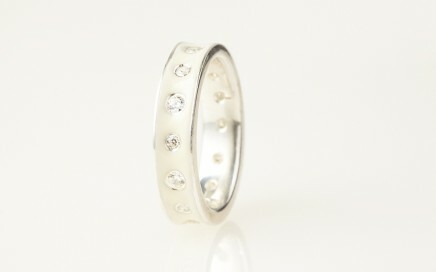 A sheik design made in Recycled Silver and Coloured Enamel, the band is approximately 5mm high with fourteen Cubic Ziconia ’s set into the band. 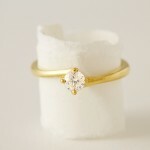 Enamel Rings start from £1950 for a band inlayed with a coloured enamel of your choice in 18ct Fairtrade Gold and set with Cubic Zirconias. 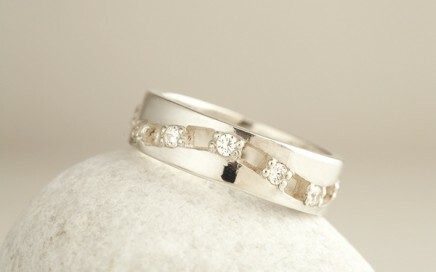 Prices start from £430 for a band inlayed with a coloured enamel of your choice and set with Cubic Zirconias. 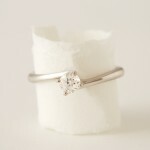 Can be made as wedding sets or a single ring. 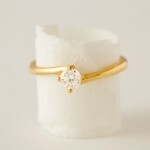 The 18 carat diamond ring studded with 0.09 carat Canadian Diamonds swirls around the finger and is complemented by the 18 carat gold band. 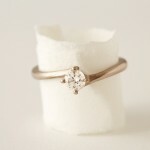 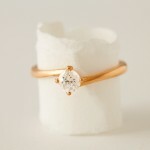 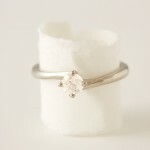 Prices start from £1325 for six 1.5mm 0.09 carat flush set Canadian diamonds in 18ct Fairtrade Gold ring.